This easy recipe is a healthy alternative that's perfect to pack for all of your summer picnics. One of my favorite things about summer is picnicking on the beach, at outdoor concerts, or just in the park hanging out with my daughters. While you're pregnant it's usually recommended you stay away from processed deli meats (seemingly everyone's "go to" sandwich for picnics). This week I've got a crowd-pleasing, easy to make, healthy, upscale alternative to share with you that's perfect for packing to go. 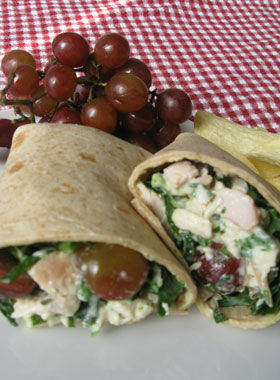 My Tarragon & Grape French Chicken Salad combines tender chicken breast with juicy grapes and an underutilized but seriously delicious fresh herb: tarragon. If you haven't used fresh tarragon definitely give this one a try! It lends a delicate anise-like herbal flavor to dishes and is excellent in eggs, fish dishes, dips, marinades, and dressings. It somehow makes everything taste like you might've picked it up at a little French cafe. This recipe also uses a favorite "lighten it up" recipe-writing trick of mine. I often combine one part low fat mayonnaise with one part low fat Greek yogurt for the dressing in any mayo-based salad or dip. You'll never taste the difference and in fact, the Greek yogurt adds a deliciously bright tang to the dressing. Try it in tuna salads, egg salads, dressings, dips, deviled eggs, etc. The dressing for this dish gets an extra kick of flavor from some Dijon mustard and honey too. This salad is perfect for picnics when tucked in whole wheat wraps with some arugula, baby spinach, or your favorite mixed greens (note: easy way to sneak in an extra serving of leafy greens!). It holds together well... no worrying about forgetting to pack the plastic utensils. I'll often pick up pre-cooked chicken breasts or a rotisserie chicken (or just use leftover grilled chicken) and make this recipe in advance to have at the ready for spontaneous picnics. It will keep for 3-5 days chilled in the fridge. You can even put these wraps together the night before an outing wrapped tightly in foil or wax paper. Just toss some baked chips, crudité, and fruit salad in your cooler and you're ready to go. (Ok, maybe some cookies or brownies, too—the rest of this menu is uber-healthy after all!). Just be sure to keep these and all sandwiches well chilled so they don't spoil in the heat. One last little picnic-packing idea? Keep some of your favorite picnic beverage (lemonade? iced tea?) frozen in ice cube trays to add to your drink cooler. As the cubes melt your drink stays cold without getting overly watered down.